I wanted to let you know that if you like being a pioneer and exploring new programs, FamilySearch.org has a new Wiki page that is out in Beta. If you are unfamiliar with a Wiki website, I will explain to you what they are. These websites are designed to be a collaborative website where people work together on creating the content and direction of the site. The direction of the FamilySearch.org's Wiki is towards providing an area that will help provide information on how and where to search for Family Records. It is a support based wiki site. 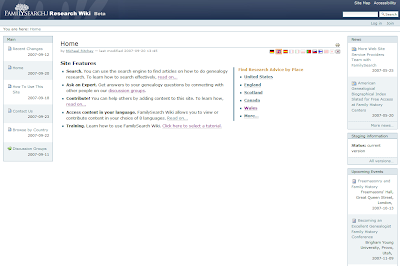 FamilySeach Wiki Beta, allows for your to search for genealogical advise by country, providing you with historical information about your county as well as possible databases to research in. The wiki site will become a great resource of information and I will be checking it frequently as well as contributing to the information. Remember that this site is still in Beta testing, which means to you that some things may not work properly. If you happen to receive an error message, try and report the problem utilizing the feedback links provided. If you would like to learn more about this beta test, click FamilySearch Wiki.